Tim Lucas is the editor of Video Watchdog, a bi-monthly magazine devoted to dissecting and discussing genre cinema, which recently celebrated its 20th Anniversary. 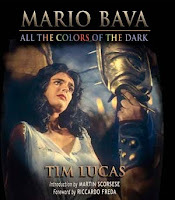 He is also the author of Mario Bava: All the Colors of the Dark, a book so large and heavy that no one has yet been able to open it. Tim assures us it's a good read though. Tim Lucas: I came to Thriller very late in the game. I was around in the days when it was on, but it was scheduled past my bedtime. I'd had some traumatic encounters with Twilight Zone and Hitchcock episodes, so it may have been kept away from me. I can remember hearing the theme song from my bed. One of my specific memories regarding Thriller is one of those rare summer days when I actually went out to play. When I got back, my mother told me I'd picked the wrong day to go out because there had been this great horror movie on TV called "The Red Wig." Already Horror's young Walking Encyclopedia, I told her there was no such movie, and checked the TV schedule; there was nothing horror-oriented even scheduled. She insisted she had seen it and proceeded to tell me the story. Many years later, I discovered she must have seen the Thriller episode "A Wig for Miss Devore," and which a local station must have pulled into service as a time filler when some other program ended early! I later surprised my mother by showing her the episode... and she had no recollection of ever seeing it, or ever telling me about it! I didn't begin to see and appreciate the series properly until, oh, the late 1980s and early 1990s, when my Florida-based friend Bill Kelley began sending me dubs of the complete series as it ran in Fort Lauderdale on a PBS station, commercial free, late on Sunday nights. Bill has since passed away and I was glad to be able to mention him in one of my commentary tracks, since it was he who passed the Thriller baton to me, so to speak. JS: How did you become involved with the DVD project? TL: I was coming out to Los Angeles on other business and was invited by my friend David J. Schow to join him for a commentary or two. There was no money in the budget for flying people in, so my availability was a convenience for all concerned. PE: Were there any episodes you were keen to do in particular? TL: I got my pick, as long as my pick hadn't already been claimed. I requested "The Grim Reaper," probably my favorite episode, and I suppose it was early enough in the game not to have been claimed. (This was mid-October 2009.) I stayed at David's crib, high in the Hollywood hills, the night before the recording session and we watched the episode, taking notes, and then watched "The Premature Burial," which I was also invited to speak about, if I felt I had anything worth saying. I didn't think I would, but I did — it was a better episode than I remembered, particularly from a cinematographic point of view. So I suddenly saw this as a rare opportunity to use a commentary track to discuss visual grammar. We also invited our friend, director/cinematographer Ernest Dickerson, to join us on the session. David worked with Ernest years before, when they were both plotting a vampire movie that became Blade, and I'm presently developing an original horror script with Ernest called Scars & Stripes. Listening to the track, it's a little odd hearing myself spouting off all these observations about camera position and visual framing devices, while sitting right next to the genius who photographed Spike Lee's Do The Right Thing! But Ernest turned out to be a valuable add to both tracks anyway, not only in terms of discussing how they were shot, but for what he was able to bring to the table as an experienced television director. PE: Did you give thought to any more commentaries? TL: Sure, I would have loved to hang around and lend my thoughts to any number of episodes. But it's not really the episodes that were already taken that most concern me. What bugs me is seeing a worthy episode in the Image set that doesn't have a commentary, because in a collection so utterly festooned with them, the episodes without commentary tracks project an impression of being unloved. As I go through the episodes again, I think it's particularly sad that an episode like "The Watcher" has no commentary. I wish I could have done it, especially with David moderating. It's a serial killer story directed by John Brahm, and the killer is a portly fellow with a perverse puritanical streak, so it very much belongs in brackets with Brahm's classics The Lodger (1944) and Hangover Square (1945) — moreso than anything else Brahm ever directed for television, and there's no one on the set standing up for it, which annoys me! JS: And now on to our infamous questionnaire. What's your favorite Thriller? After "The Grim Reaper," or alongside it, I'd say "The Incredible Dr. Markesan." Oddly enough, I'm one of those exceedingly rare viewers who just doesn't feel "Pigeons From Hell" or (for the most part) "The Cheaters." I'm sure I'd feel differently had I seen them as a kid. TL: Oddly enough, its use of the Universal backlot. I love recognizing exteriors and set flats from other movies and TV series. The series recognizably takes place in the same universe (no pun intended) as Leave It to Beaver, Psycho, The Munsters, The Ghost and Mr. Chicken and some Joe Dante movies. It's interesting to me when the exterior of the Psycho house leads to some other conglomeration of walls and steps and furnishings inside, when it turns up in a show like "Masquerade" or "The Hungry Glass." But most importantly, the show's cinematography is the best the genre had up until The Outer Limits — Bud Thackery and company were not afraid to pour on the shadows and atmosphere, nor to compose for the big screen though they were shooting for TV screens that were much smaller in those days. Especially when one considers how poor most television reception was, in those days, I find the glossy 35mm look and inventive cinematography of the show miraculous — not to mention brave of the show's producers! TL: The schizophrenic nature of the show, the way it's divided between mundane and fantastic stories. The classic episodes make us want to embrace the whole series with enthusiasm, but even some of the fantastic themed episodes are somewhat stale in execution. 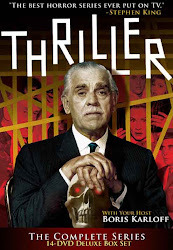 So it's hard to embrace Thriller as a blanket experience, in the way we can embrace Twilight Zone or The Outer Limits, as a show you can watch at random and be reasonably assured of having the experience you're hungering for. Those other shows can go up and down in quality too, but even the lesser ones give you approximately what you want. TL: Thriller, I guess. As I said in my previous answer, it's a tough show to distill to a single idea or expectation. TL: "Man in a Cage." Set in Tangier — which everyone (even the locals) calls "Tangiers" — it's like a weak Man From U.N.C.L.E. episode with dull Phil Carey filling in for a vacationing Robert Vaughn and David McCallum. There's a lot of walking around. The actors exit one room and enter another, clear across town, because the show had no stock footage budget to make the transitions smoother. Philip Carey is a dull leaden hero, and he's in the cage for such a short time, it hardly warrants titular mention. I must say that "Master" Barry Gordon is not particularly convincing as Slip-Slip, a prepubescent, fez-wearing Moroccan businessman on the make. The climax also takes us too swiftly from grim possibilities to a laugh-and-pat-on-the-back ending. If the show had any kind of pulse, it might at least be good for a laugh, but it's sheer agony. Be sure to check out Tim's commentaries on "The Grim Reaper" and "The Premature Burial"! You're absolutely right, Tim. "The Watcher" is an impressive show that should have had a commentary. We missed more than a few good ones. Still, Steve and I were working under less than ideal conditions, and toward the end, we were really being pressured to "finish the damn thing." BTW, I can't tell you how delighted I was when David told me you were in town, and could participate in the project. Geez, why couldn't you have stayed in LA an extra week and done more for us?! If this collection ever goes blu-ray (50-50 chance), hopefully we can plug up some of those holes. Fixing the much-despised soundtrack mixes would also be nice. Interesting point about "just how many" great shows THRILLER actually did produce. Indeed, is a TV series worthy of such high praise if the majority of episodes are simply passable, and a whole bunch clearly stink? My view: The classic episodes of THRILLER were so unique and groundbreaking that, even if we're only talking about, say, maybe 20 out of 67, they still propel the show itself to a solid first-tier position. Once experienced (especially back in '61), these mini-film masterpieces are simply never forgotten. And speaking of the Blu-ray possibility, while the music commentary on "Terror in Teakwood" is probably my favorite of the ones I've audited so far, that episode needs another commentary to focus on the actors and action. File that thought away, just in case! Gary brings up the subject of just how many great shows were on THRILLER. Many episodes were mediocre and some were "just" good or very good and several were outstanding. But, the classic shows were so unusual and excellent that I consider the entire boxset to be a 10 out of 10, in other words, great. This is based on such fine horror episodes as The Weird Tailor, The Grim Reaper, Dark Legacy, Pigeons From Hell, The Terror in Teakwood, and many others. And I bet most of the rest of us, including our hosts, feel the same way. Otherwise why on earth would we be posting and commenting on this interesting blog. As Gary said above, the lack of time and money did prevent us from recording commentaries for every single show that we felt deserved one. We were lucky to get as many as we did, considering that the overall attitude from the scheduling department was to get the set done and done quickly. My belief is that Image would have indulged more tracks a la THE TWILIGHT ZONE, if they absolutely knew the set would sell. I hope that somewhere down the line we can revisit the series for BLU RAY and add a number of new tracks. Tim, you will definitely get a call if we do! I think I speak for John when I say you better use our commentary for The Fatal Impulse or else.